Reinforcing language is a powerful tool that can make your instruction SO much more meaningful. When I changed the way I used reinforcing language, the shift I noticed in my students was drastic and almost immediate. In fact, I'd even go as far as to say that the majority of the language you use when students are working should probably be reinforcing language. According to Responsive Classroom, "teachers use reinforcing language to show that they see students’ positive academic and behavioral efforts and accomplishments. Their words are specific and descriptive; their tone is upbeat and encouraging." Remember to frame your language in a way that does not put an emphasis on getting your approval. For example, "I like how you used quotation marks so your reader would know who is talking," could simply be changed to, "You used quotation marks so your reader would know who is talking." With a warm tone, this still conveys that you're proud, but it takes the emphasis away from pleasing you and places it on doing great work. Reinforcing language is my secret weapon. 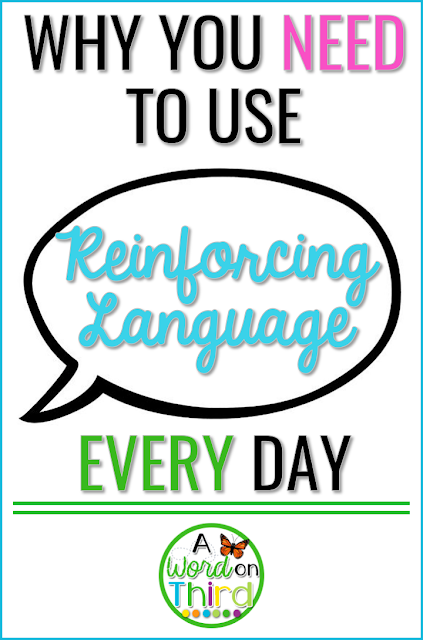 Here's why I think you should use reinforcing language too if you don't already. It builds confidence and community. When a teacher says, "Good job," it's nice, but it doesn't give any substantial feedback. Good job with what exactly? What do you want the child to replicate? When a child hears the exact, specific skill they did a good job with named, they will probably want to continue doing it. They'll feel recognized for their hard work. When you can give that specific feedback, in social or academic situations, you are building a community of learners. You show what you value to your students. Teachers can get stuck in the rut of correcting mistakes too often, especially since we were probably taught that way as kids. Be mindful of how damaging that might be to a students' self-esteem--especially if it's already low to begin with! Confident students are going to behave better. We'd all rather take a preventative approach to classroom management rather than a reactive one, right? Students who may be unsure of what to do but then get specific feedback about what they did well will continue doing that thing well. Oh, hey, look! That builds confidence! I know you can see the correlation between reinforcing language and preventing misbehavior, so I will leave it at that. It deepens understanding of concepts. If you can walk around at some point during independent work time and and simply name what you see, you are making a huge impact on your students. Try to do this at least once per day (or even a couple of times per week). For all intents and purposes, you'll be having a bunch of mini compliment conferences and guiding students forward in the right direction with a burst of positivity. This is especially useful when you know a student was struggling with something. It's so important to celebrate struggling students and validate the hard work they did by positively reinforcing progress towards an ultimate goal or meeting that goal. HAPPY REINFORCING, EVERYONE! I promise you will notice a huge difference in your students' independence and an improvement in your students' academic performance when you consistently use this type of language. If you want more detailed information on how to incorporate reinforcing language into your day, check this post.